Meanwhile, the search for my perfect in-ears continues. So far, I haven't had the best luck with the earbuds I've reviewed: The OnePlus Icons were unremarkable, and though Earin sold me on the idea of totally wireless earbuds, the execution left something to be desired. And so my ridiculous, Goldilocks-ian journey to find my perfect in-ears continues, this time with the $199 Master & Dynamic ME05. If your face contorted in puzzlement upon seeing that name, well, I did the same a few months back. Master & Dynamic is a relative newcomer to the world of high-end audio -- it's about a year old -- and the company considers itself as much a design house as a collective for audio nerds. Their fondness for the olden days looms large across their products, even in small packages like the ME05. 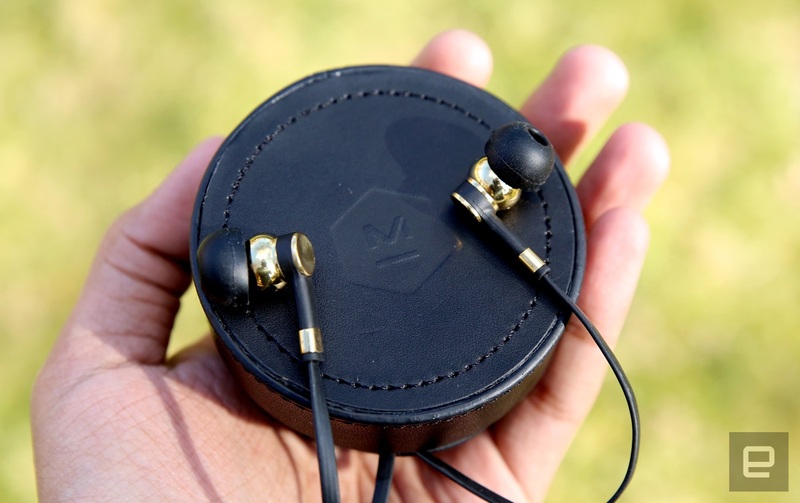 In this case, the telltale sign of M&D's retro-fetishism is the earbuds' design: Rather than the usual plastic, they're made of hand-finished brass because of its particular acoustic qualities. I couldn't tell you what metallurgical quirks make brass an interesting choice, especially since M&D also makes these buds out of palladium, but whatever. The ME05s are the best-sounding in-ears I've tested so far. Highs were crisp and mostly free of distortion (something the Icons had trouble with), and the mids that make up most of my personal collection came through clearly. Still, neither of the earbuds I've tested recently managed to impress me with their low-frequency performance. The ME05s do a much, much better job down in the depths, though, and they stand out because of balance rather than pure power. While the intro to the Teddybears' excellent "Still Alive" remix felt unnaturally punchy on the OnePlus Icons, the ME05s rendered it more subtly, letting the tentative, throbbing bass coexist harmoniously with a powerful kick-drum rhythm. That was the case for nearly every thumpy song I threw at these things. It's a seriously refreshing change, but maybe not a surprising one, considering the asking price. What's more surprising is how damned comfortable these are. After popping on two of the included medium-size silicone ear tips, the ME05s slid into my ears like shining brass bullets and stayed there even as I bounced around on a plane. You'd think a pair of mostly metal earbuds would put extra strain on your ears, but I almost forgot I was wearing them a few times. (I remembered after the cord tugged my phone off a table.) 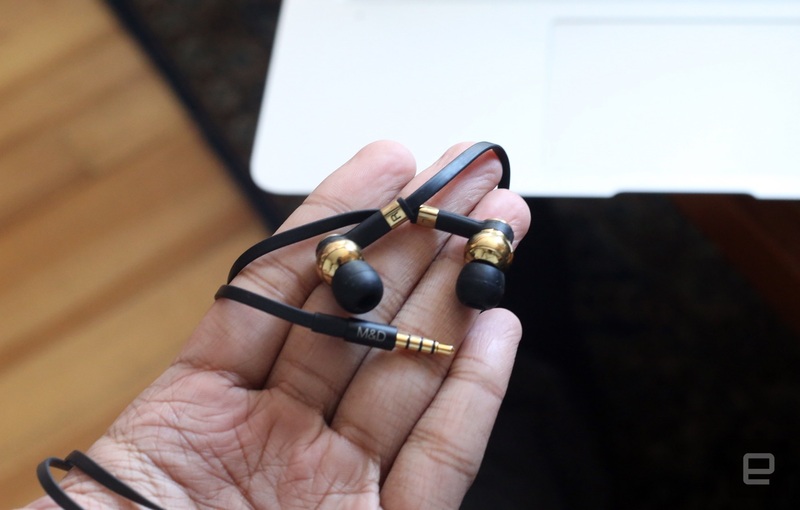 There's a weird sense of cachet that comes with wearing gleaming golden earbuds, too. Is it weird that I feel sort of cool wearing these? Because I do. It's too bad, then, that the ear tips seem to pop off the buds seemingly for no reason. Maybe it's just me; I usually toss my earbuds into my bag or pocket whenever I need to run around. Still, I've done that with every single pair of earbuds I've owned (there have been many), and losing a tip is a surprisingly rare occurrence for me. It'd be a much bigger problem if the ME05s came with only one set of tips, but extra-small, small and large replacements are included in a handsome leather box. After losing two sets, I'm running with the large buds now, and they'd better hold -- there's no way those extra-small ones are going to work for me. Part of searching for the ideal earbuds is knowing when to finally give up and settle for something close. New as the company is, Master & Dynamics has a winner with the ME05s -- so much so that I might be ready to call off my search completely. Maybe. Someday. Oh, whatever, who am I kidding? It's a big acoustic world out there, and my ears are only getting started.